Wang Shixiang 1993,p. 217, plate 37. The citrons were identified as berries in Treasury 7, but they are in fact juyuan, citron. The rebus in the four main elements of the design here is Fu yuan shanqing, ‘Bat citron fan musical-stone’→ ‘Good fortune comes from good deeds’. 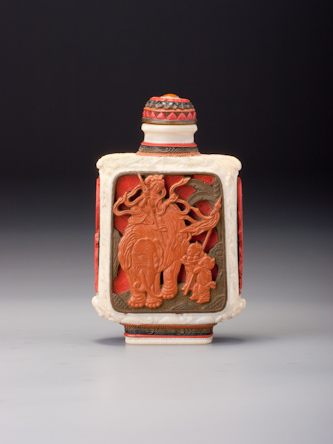 When this bottle was owned by Wang Shixiang and illustrated in his Shuo hulu, it had neither the ivory lip nor the present stopper. The wide mouth and very thin lip suggest that it must originally have been intended to have some sort of additional lip and inner neck fitting, and ivory seems to have been the standard. Whether its ivory neck was ever fitted, however, is another matter. 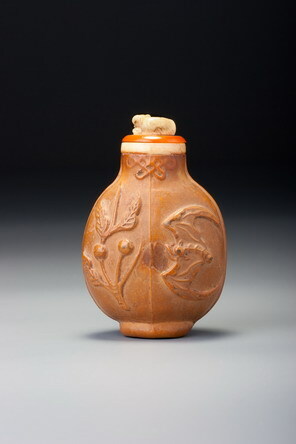 With an art form in which the wood panels were carved by craftsmen in the palace workshops, the gourds grown under the supervision of eunuchs in the palace gardens, and the finished products sent, presumably, to the ivory workshop to be fitted with their protective lips, there is always a chance that some examples never made it through the entire process. Both the lip and the stopper were added recently, the delightfully well-carved sleeping dog on the stopper having waited patiently for a quarter of a century in a drawer full of spare stoppers before finding a new home on this bottle. Wang Shixiang dated this example to the Daoguang period, and we believe, as always, that he is probably correct, but we have left a little leeway.